Watching loved ones get older and experience the changes that come with aging can be tough, especially if your loved one is showing signs of memory loss or dementia. It can be even more difficult for the individual experiencing those changes. Knowing when to get checked can make a big difference in helping yourself or your loved one maintain a high quality of life as mental changes take hold. Alzheimer’s disease is a type of dementia that causes a slow decline in memory, thinking and reasoning skills. It goes beyond typical, age-related memory loss such as temporarily forgetting a loved one’s name, getting confused about what day it is, or making an occasional error in managing finances. 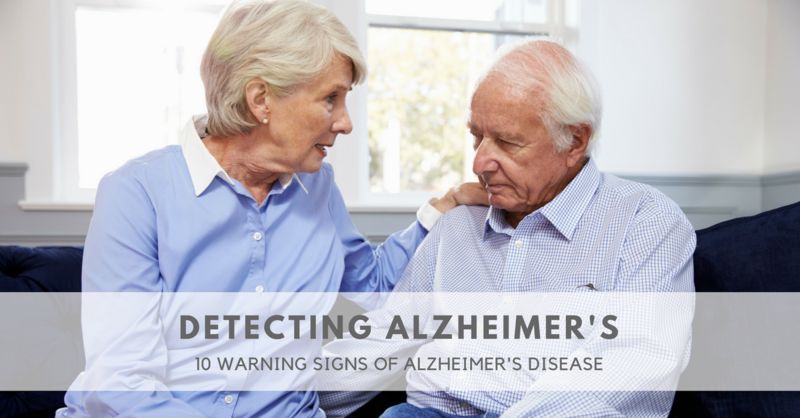 There are 10 common warning signs and symptoms of Alzheimer’s. While the degree of these warning signs often varies from one individual to the next, if you notice that you or a loved one is experiencing any of these symptoms, schedule an appointment with your doctor. Memory loss that disrupts daily life — Forgetting recently learned information, important dates or events, repeatedly asking the same questions and an increasing need to rely on memory aids or family members to remember things is one of the earliest signs of Alzheimer’s. Challenges in planning or solving problems — Some people with Alzheimer’s may have problems developing and following a plan. They may struggle to deal with numbers or have difficulty following a familiar recipe or keeping track of monthly bills. It may take more time and concentration to complete tasks that once came easily. Difficulty completing familiar tasks at home, at work or at leisure — Completing daily tasks often becomes difficult for people with Alzheimer’s. Trouble driving to a familiar location, managing a budget or remembering rules of a favorite game are a just a few examples. Confusion with time or place — Difficulty keeping track of dates, seasons and the passage of time is another sign of Alzheimer’s. Sometimes people with Alzheimer’s may forget where they are or how they got there. Trouble understanding visual images and spatial relationships — Vision problems is a sign of Alzheimer’s for some people. From difficulty reading to judging distance or determining color or contrast — all of these can be a sign of Alzheimer’s, but some changes in vision due to age or cataracts is considered normal. New problems with words in speaking or writing — People with Alzheimer’s may have trouble following or joining a conversation. They may stop in the middle of a conversation with no idea how to continue, or the may repeat themselves, having the same conversation over and over. Struggling with vocabulary such as having problems finding the right word or calling something by the wrong name are also signs of Alzheimer’s. Misplacing things and losing the ability to retrace steps — It’s not uncommon for any person to misplace something, such as car keys, but someone with Alzheimer’s may begin putting things in unusual places or have problems retracing their steps to find the lost item. They may also accuse others of stealing. This symptom may occur more frequently over time as the dementia progresses. Decreased or poor judgement — We all make bad decisions from time to time, but a person with Alzheimer’s may begin to lack the ability to make good decisions altogether, such as when dealing with money, when it comes to things like personal grooming. Withdrawal from work or social activities — It’s not uncommon for someone with Alzheimer’s to begin to avoid being social due to the changes they’ve experienced. They may start to remove themselves from hobbies, work projects or other activities they once enjoyed, such as sporting events. Changes in mood and personality — There are several mood and behavioral changes that often accompany Alzheimer’s, such as depression, anxiety or hallucinations. If you notice any of the 10 Warning Signs of Alzheimer’s in yourself or someone you know, don’t ignore them. These symptoms are a sign it’s time to schedule an appointment with your doctor. Dealing with dementia and/or Alzheimer’s disease can be frightening and stressful. If your loved one is facing a diagnosis of Alzheimer’s disease, you are not alone. The Cottages Senior Living offer state-of-the-art certified assisted living residences for people living with Alzheimer’s and other memory disorders as well as short-term respite care.